Umbria retains an ancient tradition of spirituality and mysticism. Its history tell us of miracles and mysteries, taking places in hermitages and abbeys, enshrined in its wildest and most secluded recesses. Città di castello: the splendour of Reinassance. 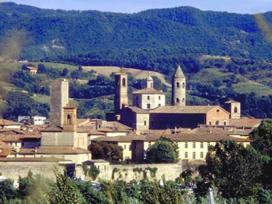 Città di Castello is Umbria’s nort-western gate, easy to reach from Arezzo, through E45 and A1. The town reached its peak during the Reinassance, when the leading Vitelli family had its center embellished by some of the most renown artists of that time, whose works are now hosted in the Pinacoteca Comunale. Saint Francis's Good Rest. The Hermitage of Buonriposo, 5 miles from Città di Castello (vocabolo Sodo, vocabolo Uppiano), derives its name from Saint Francis having a stop over here, and exclaiming “Oh, che buon riposo” (Oh, what a good rest), in appreciation of the place. Crossing Appennini. The Sanctuary of Madonna di Belvedere (SS 257 towards vocabolo Surchio) can be reached from Città di Castello, following SS 257 for 20 miles, through pictoresque landscapes. As its name suggests, it offers a breath-taking overlook on the Appennini, for miles and miles throughout Umbria and Marche. Umbertide: Abbey of San Salvatore and Hermitage of Monte Corona. Few more than 10 miles from Pieve de’ Saddi (vocabolo Palazzo, Maritonda Terza, Zona Corlo, Zona Faldo), Umbertide offers gems such as the majestic medieval fortress, the Collegiata (an unusually octagon-shaped church) and, in the Church of Santa Croce, the wonderful Deposizione, painted in 1516 by Luca Signorelli and still in its original position. Our journey continues to the benedictine Abbey of San Salvatore di Montecorona, (Borgo Baraglia, Badia, Località Colle, Località Badia di Monte Corona).